This late Renaissance building served as the town hall of the Lesser Town from the late 15th century until 1784. It has been rebuilt a number of times over the centuries and the most recent reconstruction returned its original appearance with towers and dormers from the 17th century. In 1868, the Malostranská beseda was established in the building and continues to offer a rich variety of cultural activities and catering services to this day. In 1257 Přemysl Otakar II. Founded Prague's New Town under the Prague Castle. He chased the original Czech population away and brought the German colonists here. When Karel IV. established its magnificent Prague New Town, the original Prague New Town was renamed to Malá Strana (Lesser Town). Initially town representatives assembled in the original St. Nicholas Church and later they built the town hall in the middle of the Square, which is proven by the first report of 1407. That was irreversibly destroyed together with the town's books by the king's soldiers during the Hussite wars about 12 years later. Another Town Hall of Malá Strana, called the old one, was established in the house, the town had received from the legacy of the clerk, Václav z Bítova, also on Malostranské náměstí no. 2. The town hall was here until the year 1478. From that time two Gothic prisons in the courtyard and Malá Strana mural castle tower remains in the back area of the courtyard from the time of Přemysl Otakar II have been preserved. 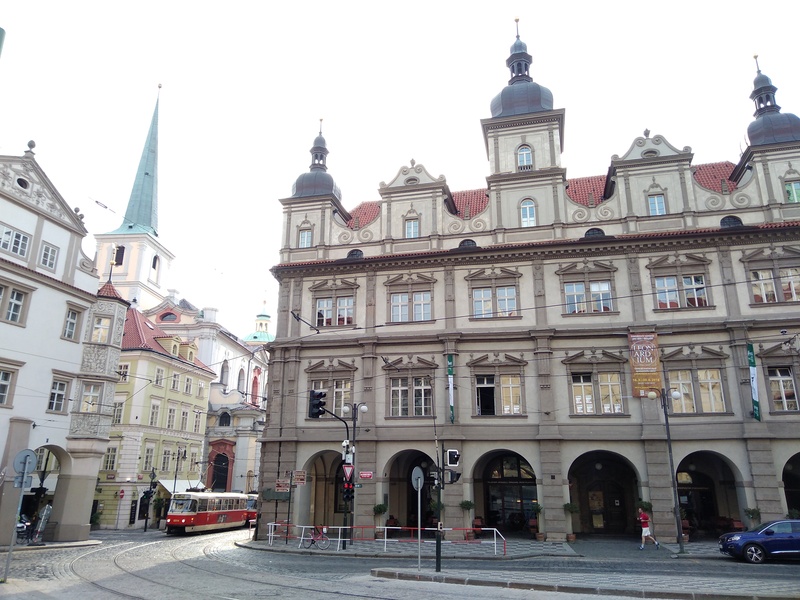 In 1478, Malá Strana citizens bought the plot at the eastern corner of the square and today's Letenská Street from Jan Tovačovský z Cimburka and built a new town hall building with a large late-Gothic hall. Here meetings of 11 councilors with the Mayor, the imperial magistrate and clerk took place and decisions on the town administration, criminal and civil matters, orphans and other matters were dealt with. The building is memorable through the so-called Czech confession that was written here in 1575: these were the articles compiled by the Czech non-Catholic opposition as a basis for discussing the legalization of religious freedom. The memorial bronze plaque on the event is placed on the house. This so-called new Town Hall of Malá Strana building was once the jewel of the town. The Sadeler engraving from 1606 depicts the one-storey part with arcades in addition to the two-story tower on the corner. The current late Renaissance style form has been the result of rebuilding in the years 1617 to 1622 perhaps by the builder and stonemason Jan Campion Bossi according to the project by Giovanni Maria Filippi. Rebuilding in the style of the late Renaissance and Mannerism was meant to keep up with the fast-growing representative buildings in the area. In 1648 Swedish troops brought devastation throughout whole Malá Strana and the barely completed house was plundered. In the arcade the portal gate with the sign from 1660, when the house was adjusted by Vilém Oppenried in the early Baroque style, has been preserved. Today's appearance is from around 1820, when original gables and three towers were removed during the building adjustment by the architect Josef Kaura. Nevertheless, the facade to Letenská Street has been preserved in its original form. The town hall served its purpose until 1784, when all four towns of Prague, i.e. the Old Town, the New Town, Hradčany (Prague Castle) and Malá Strana (Lesser Town) merged together. At that time the administration of merged towns was transferred to the Old Town Hall. Within this event the inlaid doors from 1619 were transferred from the Town Hall of Malá Strana to the Old Town Hall, where they have been placed in the still familiar portal with the Senatus inscription. From 1784 to 1793 the building of the Town Hall of Malá Strana was converted to the seat of Fiscal Office, Inland archive and political imprisonment. During renovations in the 19th century the original character of the building was significantly damaged. In 1868 Malostranská beseda was established here, which has been offering a rich variety of cultural activities until now. From 2006 to 1 March 2010 the building underwent a complete restoration. In September 2008, 3 domes (faithful replicas of the original ones) were installed on towers after 180 years. The largest dome height is 6.5 m. Thus, the appearance of the building now respects the original look from the 17th century. The building of Malostranská beseda has had the St. Wenceslas Bell since 20 January 2010, which is located in the central tower. It was made by the bell-founder Petr Rudolf Manoušek with his co-workers. The bell is made of the copper alloy, weighs 160 kg and is not swinging.